When I think of chestnuts, I reminisce about my birth town - Domodossola, where I was first introduced to this distinctive flavoured nut. 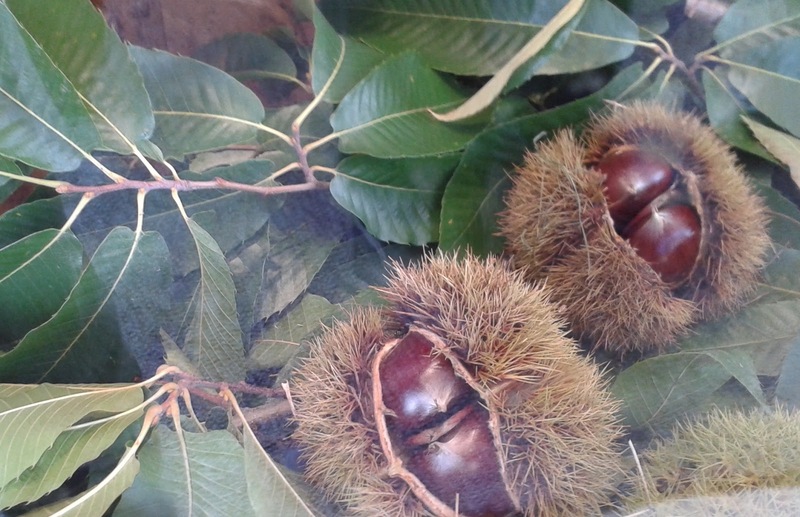 We were fortunate to live close to Sacro Monte Calvario, a mountain lined with chestnut trees. My mother cooked many dishes which used this flavorsome nut, especially sweets such as these panzerotti di castagne & cioccolato. With this sweet mamma has more recently substituted the chestnut filling with chickpeas as they are readily available all year round and knowing that my papa`enjoys this sweet made frequently. This recipe is a variation of panzerotti / tortelli di ceci which I have shared previously with you. The filling is more delicate in texture and lighter than that of the chickpea. I brought over a plate of these delicious morsels to my parents straight after I made them and naturally they loved them. It brought back many lovely memories of Domodossola. Make an incision in the chestnuts and place in a pot with cold water. Bring to the boil and allow to cook for about half an hour or until the interior of the chestnut is cooked. Cooking time will vary and dependent upon the size of the chestnut. You therefore need to cut one open to check if it is cooked and crumbly. Once cooked, drain and allow to cool enough to handle. Cut each chestnut in half and scoop out the flesh with a teaspoon into a bowl. It will crumble out of the shell quite easily. Place the crumbled chestnuts, cocoa powder, sugar, vin cotto and brandy in a food processor and pulse until combined. You may need to add more liqueur or some water to allow the mixture to come together as seen below. Prepare the pastry as you would make fresh pasta. Create a flour well and add the beaten egg, pinch of salt, sugar, vegetable oil and brandy in the centre. Slowly bring the flour to the centre with your finger tips and mix until all combined. If the mixture is too dry, add more brandy and knead until smooth. Allow the pastry to rest for a while. I use the pasta machine to roll the pastry like lasagnae sheets 2 mm in thickness. Fill with the chestnut puree using a teaspoon (try to get two morsels worth), fold the pastry over and cut into half circle shapes using a rotary cutter. Press the edges firmly using a fork. Shallow fry using vegetable oil until a light golden brown. Some of them may burst open, hence the name panzerotti (broken / burst tummies). Place on kitchen paper to soak excess oil and coat with castor sugar. I love the look of these Carmen. I am not a huge chestnut fan but adding the cocoa and liqueur sounds just delightful. These panzerotti look wonderful Carmen and I look forward to making them come late October when chestnuts are in season here. Hope to make it to Sacro Monte Calvario finally too!